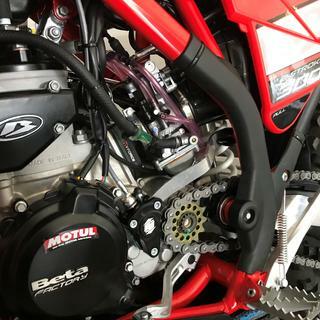 The Enduro Engineering Clutch Slave Cylinder Guard is another piece of protection from EE, one that’s specifically made to protect the case and slave cylinder on your dirt bike that’s equipped with a hydraulic clutch. Made from durable and lightweight billet aluminum, this guard mounts over your slave cylinder using bolts supplied with the guard. Along with the included knock-down bar that bridges the gap between the slave cylinder and frame, the EE guard will not only protect the slave cylinder from impact/rocks during a tip over, it also protects the slave cylinder and case from being damaged if your bike ever throws its chain. 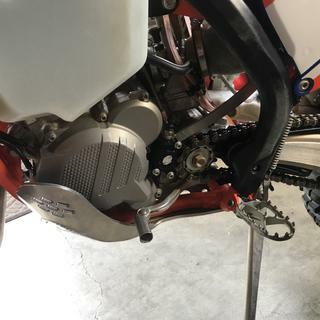 This makes the Enduro Engineering Clutch Slave Cylinder Guard a great match for your KTM, Husqvarna, and Beta motorcycles that see a lot of enduro and trail riding. Added protection & less mud build up. The stock guard on my bike would accumulate a lot of mud plus it was made of plastic. This guard from EE is well built, looks good and holds less mud. Easy to install and gives peace of mind in case your chain ever does break or bind up. A must have in my opinion for any dirtbike. Enduro Engineering makes quality products at reasonable prices. 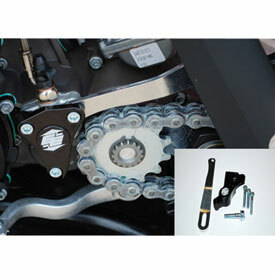 Easy to install and keeps the sprocket free of mud whereby the stock cover allows the mud to accumulate. Also helps to protect the clutch slave cylinder from damage. A must for your bike! Easy to install and gives peace of mind in case your chain ever does break or bind up. A must have in my opinion for any dirtbike. Enduro Engineering makes quality products at reasonable prices, highly recommend this item! I must have to help protect your clutch slave cylinder. A must have for a ktm! I have been buying these slave guards for years. I learned quickly when my 06 KTM 300 lost the clutch after a broken chain..... "Busted chain, Busted slave"
We ride off road over/ in /thru the rocks, creeks and logs of Western Pa. I have broken a chain or two or three along the way since I started using this product and these have protected my clutch slave every time. For the small expense of these guards, they offer invaluable protection when you're 5 miles deep into the hills and would prefer to have a functioning clutch for the return trip! This is a great guard. I've not had a chain explode yet but it seems like it could handle that. Love Enduro Engineering and the fact that their products are made in America. Only gripe with this is the aluminum bar included with it started to splinter after being hit. Very unusual. In any case, that means it took the blow of something headed for my cases or clutch, so it did its job! This is a very nicely made item. I put this on as a precaution and since i haven't had a chain come off yet i cant tell you if it works 100%. The design looks to be sufficient to knock down any over riding chain so i like it. its simple to install i would recommend it to anyone with an exposed slave cylinder. the alternative is a new case. Protect you ride cheap insurance. Instructions and photos weren’t the best. 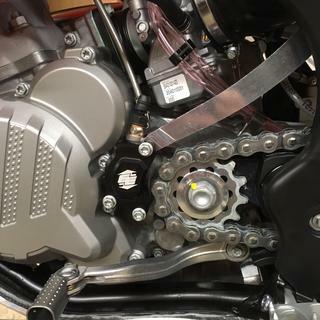 The EE Clutch Slave Cylinder Guard was very easy to install on my 2017 KTM EXC500F and it give peace of mind to not have to think about damaging the clutch slave cylinder. Bought mainly to remove stock guard on a ktm 300 because the mud would fill up inside stock guard when riding muddy conditions to save wear on chain. This solved problem with mud packing up An will is made well todo its job an protect the case ! This clutch slave cylinder guard seems well made and solid. Definitely allows mud to clear itself easier than the stock guard. The instructions were a little unclear in the orientation of the bar and chain slider. I tried several times to follow them before just looking up some pictures online. Once mounted, it is fine. EE has everything you need to protect your ride, protection means more time doing what you like, RIDNG! Got it since my buddy had one and loved it. Looks good. I have it tested the strength yet but looks like it will redirect the chain down if needed. Installed one on my 2014 ktm 250xc. It looks way better than the stock cover and is way better quality than the cheap plastic oem ones. It also eliminates all the mud and rocks from getting built up behind your stock cover. Highly recommend this product as i will be installing one on all my bikes to come. Great product for a great price! Works and looks way better then the one that comes stock on the Betas. I have it on my 2018 and a 2017 Beta 300. Another great product from EE. Install was easy and works just as it should. The oem case saver just held on to so much mud that it was keeping my entire chain completely coated in mud for the whole ride. I don't like buying chains and sprockets any sooner than I have to so I put this on. Problem solved. Inexpensive insurance policy to add some protection from sticks and rocks. Easy to install and adds a nicer look to your bike. These look good and keep the mud from compacting under the OEM cover. They are also Made in USA. Super easy to install. No brainer for any KTM or Husky. Fit and quality is great. Keeps the front sprocket clean of mud. Well worth the cost to protect the KTM Clutch cylinder. EE never disappoints. I have mixed feelings. It's a superior protector, but you have to re move the steel guide every time you need to access the float bowel drain, or the main/pilot jets. No more loosening the the carb boot and rotating. All EE products are good. This is definitely a step up from stock. I watched my buddy pop his chain off the rear sprocket and tie a chain knot in the swing arm at Moab and immediately went home and ordered this. Pretty decent product. Doubles as a slave cylinder guard + case saver. Installation can be a bit tricky, but not cringeworthy. Bought after watching a riding buddies chain derail and it saved his cases and slave cylinder. Was enough evidence for me to by the same for my KTM. This is a product I put on every bike! It is worth a couple bucks! Fitment and easy installing makes it even better! If you have a hydraulic clutch this is a must have. I have seen a chain come off come forward and end up cracking the case. For the price of this case saver its worth every penny. This is a must have! Easy to put on! Great protection! Just purchased one for my 2013 250 XC. I have one on my '09 200 XC. I purchased the 250 used and can see that someone had a banged up the clutch slave a bit. This is one of my first upgrades. Bolts right up with no issues. I don't have any issues with breaking chains anymore but I like the piece of mind if I do break a chain it's not going to damage my engine. Have gotten these on each of my dirt bikes. They are quality items. Have never had an incident that tested it though. will this part work with a recluse exp core clutch? BEST ANSWER: Yes but it will need to be modified/drilled out so you can dial in the Rekluse slave cylinder adjustment Allen head. Rekluse makes a slave guard specifically for this application. I Have a KTM exc500 with a exp core clutch and had no issues with installing this as well. Yes, the clutch slave guard, goes on the left side of the engine, while the recluse exp core clutch is internal and in the opposite side. Works fine, no interference. It will work but you will not be able to adjust the clutch slave without removing it. Recluse makes one that you can adjust and adds protection. The guard will work however, it will cover your adjustment. This mounts through your slave cylinder with longer bolts. I don't know for sure, however I would think that it would. Mine just bolted on and cleared the stock clutch cover just fine. It should work. But if your slave cyl. has the adjustment screw, you will not be able to access screw with the cover on. Its working witch my 2013 ktm 300xcw but for the quick recluse adjust I drill a hole on the center. believe that comes with its own slave cylinder with adjustable preload screw. Yes, it just bolts on top of it. Does the aluminum guard fit over-top the slave cylinder ? Do you have to remove the 3 OEM bolts to do so ? Does the fluid leak out or is there a chance that air seeps into the system while installing ? Thanks ! BEST ANSWER: Yes, the guard does fit over the slave cylinder. You just remove the three bolts and install the new supplied bolts. The slave cylinder is sealed so no air can get in with it removed, just don't pump the clutch lever with it removed. On my FE350 a little engine oil leaked out so I'd probably lay bike on side if I was doing it again, but it wasn't a big problem. The guard fits over the slave. You use the longer bolts provided with the guard. Hydraulic line stays connected, so no fluid loss or air issues. I've used this guard on all my KTM's with no issues. The top right bolt was too short for my 2016 Beta 300 and stripped the end thread when tightened. A longer bolt from the hardware store fixed the problem. This guard fits over the slave cylinder and by threading into the same holes but longer bolts. Meaning you remove OEM and use the bolts they will give you and I made sure to bleed the clutch again, it does leak unless you keep a lot of pressure when changing it. It fits over the stock system. You do have to remove the stock bolts to install the EE GIARD over the clutch slave cylinder and use a couple longer bolts. I did not have any issues with leaking or air getting in the system. Less than 15min to install. It does fit over the top of the existing slave cylinder, secured by the three bolts that are supplied. No air gets in the system as the slave cylinder is sealed. Takes about 5 minutes to install. Jeremy and Jordan are both correct. Very easy to install and no need to bleed the system. Has anybody installed this guard over an Oberon CLU- 4000 slave cylinder? BEST ANSWER: OK Everybody, I can now answer my own question. I recently purchased the Oberon CLU-4000 slave cylinder for use on my 2014 KTM 500XC-W. I had previously purchased this Enduro Engineering clutch slave guard and was using it over the stock KTM clutch slave. The EE slave guard works just fine on my bike using the Oberon clutch slave as well (no mods). The Oberon is about 11mm thick at each of the three bolt holes while the stock KTM is slightly less than 11mm. Bolts were long enough and torque'd up just fine. Chain guard alignment was good too. Brian, the short answer is I have not. What I can tell you though is based on the similarities in demsisions between the brembo and the Oberon and the design of the enduro engineering guard I believe it will work for you will minor or no modification (they do share the same bolt pattern after all) the backside of the EE is very open. As the manufacture of this product I know we have not. And from the looks of the images we have found we do not believe it will fit. horror stories regarding the stock slave cylinders leaking brake fluid into the crank case. I will report back to this message if I have a successful install story. Oberon coming in a few days. Will this accommodate a 15 tooth front sprocket on a 2011 KTM 300XC? BEST ANSWER: The 15 tooth would be too large and rub on the slave cylinder guard. You may want to consider a smaller rear sprocket to get the gearing ratio you are looking for. Sorry, I can't say for sure but it fits my 14 tooth sprocket pretty closely. Yes the slave cylinder from ee should work just fine.